"The Invesco BuyBack Achievers™ ETF (Fund) is based on the NASDAQ US BuyBack Achievers™ Index (Index). The Fund will normally invest at least 90% of its total assets in common stocks that comprise the Index. The Index is designed to track the performance of companies that meet the requirements to be classified as BuyBack Achievers™. 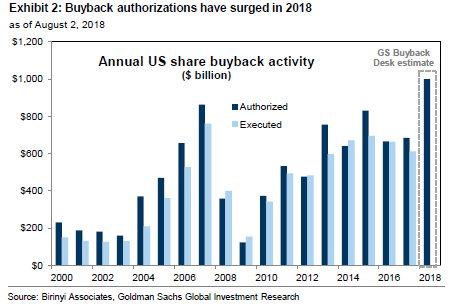 The NASDAQ US BuyBack Achievers Index is comprised of US securities issued by corporations that have effected a net reduction in shares outstanding of 5% or more in the trailing 12 months. The Fund and the Index are reconstituted annually in January and rebalanced quarterly in January, April, July and October." Given the increased buyback activity one might think an index comprised of companies instituting buybacks would be an outperforming one. Not so. Below is a chart detailing the relative return of the buyback index to the S&P 500 Index. When the blue line is trending down, the S&P 500 Index is outperforming. This has been the case since early 2015. 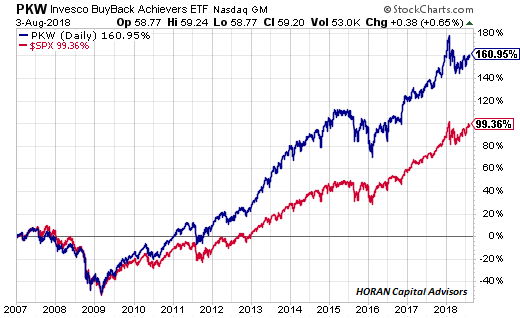 On a longer term basis, or since the end of the financial crisis, the buyback index has had significant outperformance relative to the S&P 500 Index. One could deduce that companies that had the ability to buyback shares at depressed prices coming out of the market contraction in 2008/2009 were stronger ones; hence their outperformance. 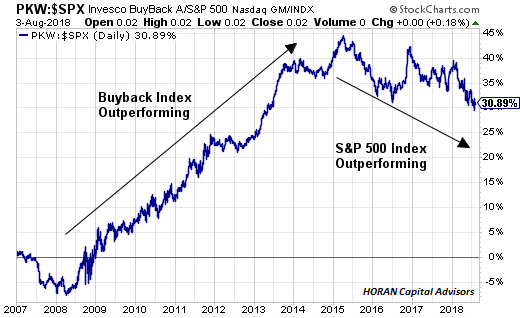 This year though, and given the hype surrounding buybacks, the buyback strategy has not been one that has generated outperformance relative to the broader market or S&P 500 Index. 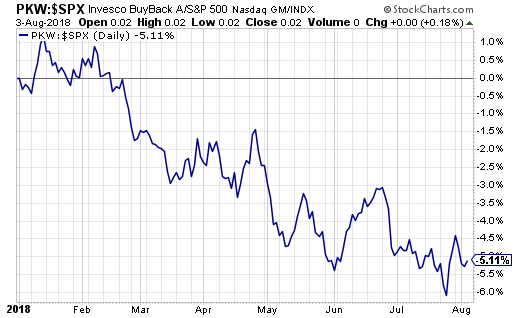 Maybe the buyback benefit falls into the category of buy the rumor and sell the news. Or possibly the market is forecasting late cycle activity; thus, an environment that has historically benefited growth stocks and not value or strong cash generating companies.